According to the sagas, Loki gets killed by Heimdall during the last great battle Ragnarök, who decapitates him. You can see Heimdall, still wearing the great Gjallarhorn, overstretching Lokis neck, swinging the axe to finish him off, while the Midgardsnake, one of Loki´s children, watches in dismay. 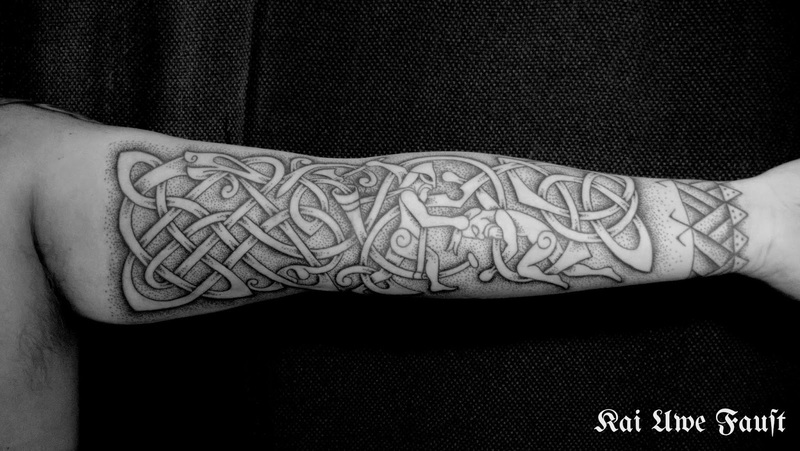 When you think about a mythological tattoo, you´re in good hands at Kunsten paa Kroppen, we have a truly gigantic library in the shop, collected during many years by Grand Master Erik Reime and all of us have a general inerest in mythology, wich is not limited to the nordic cultures.